The set shimmers. As you walk into the Chichester Festival Theatre, the vast semi-surround stage with its transparent metallic flats are lit by many chandeliers suspended low over the stage. The magic is there before the play even starts. Rachel Kavanaugh’s production is a visual delight from start to finish. That shimmering mirrored minimalist set is there to show off the most elaborate costumes, hairpieces and wigs of the era you can imagine (well, the play dates from 1700, I suspect the costumes are twenty or so years later, but I’m no expert). It’s now almost revolutionary to set a period play in period, and this shows us what we’re missing when it happens. 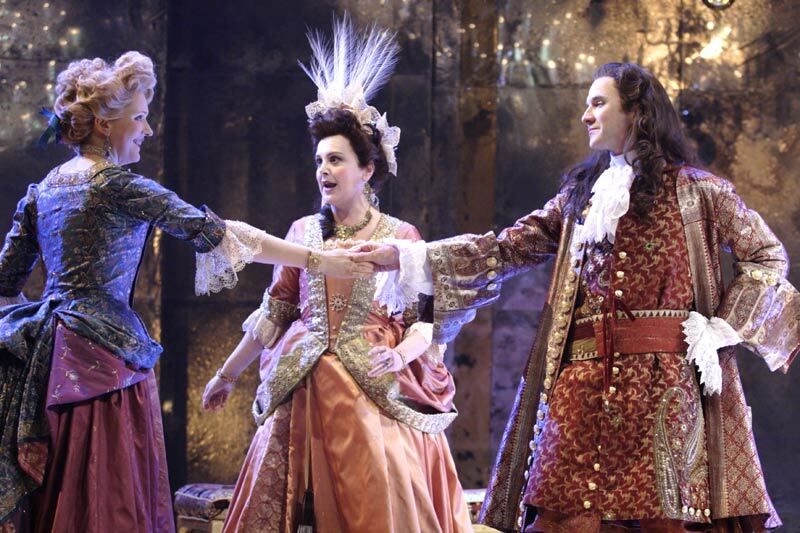 The visual delight is enhanced by superb blocking and movement so that the actors form a series of tableaux, and the costume colours seem designed to enhance the effect of the various settings. Who knows what’s direction, and what’s actor movement, but I’d say this was meticulously plotted for effect. The semi-transparent set allows us to half-see action beyond, such as Mrs Marwood, importantly overhearing the plot to dress up Mirabell’s serving man, Waitwell, as a fake suitor, Sir Roland. 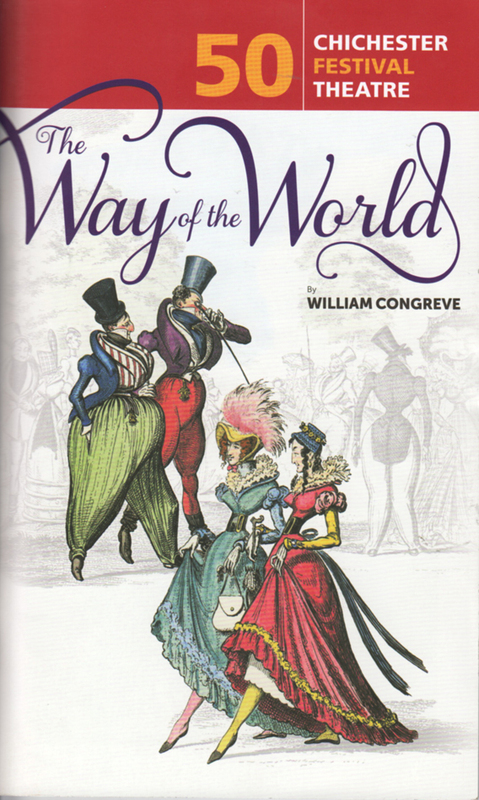 The Way of the World is described in the programme as ‘the last of the Restoration comedies’ dating as it does from the turn between 17th and 18th centuries. It’s a play with an equal number of major female and male roles, and is regarded as the point which proved the elevation in status of actresses after Nell Gwynn and Charles II’s dalliances thirty years earlier. Male / female roles are the theme too. 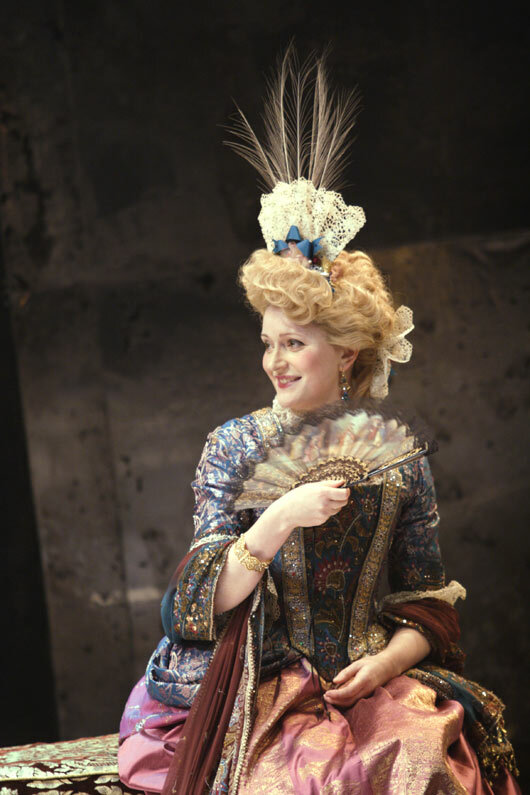 There are several knowing theatrical in-joke references in the text to ‘filthy plays,’ ‘playhouses with glossy fools,’ ‘big-bellied actresses’ and so on. At first sight, the web of allegiances, romances and dalliances appear almost as complex as the internal arrangements of Fleetwood Mac circa 1976. I read the Wikipedia notes on the plot before going which only served to turn the mildly complex into the wildly incomprehensible. Fortunately, the Pre-synopsis in the theatre programme is a model of clarity, explaining what you need to know succinctly, and also the delivery of the lines is so clear and coherent that the play is able to explain itself, as indeed it should. I would make no claim to understanding quite why or how the series of contracts between the characters worked it all out, but I was more than happy to accept that they did. The cast had the effect they have in definitive productions. After seeing it, you can’t imagine other actors in any role. OK, memory will fade, but that’s the impression you have walking out. Petulant (Christopher Logan) and Mrs Marwood (Hermione Gulliford). The two macho males Mirabell (Jo Stone-Fewings) and Fainall (Richard Clothier) sport long rock star wigs, and swagger around looking strong and solid compared to the wispy fops, Witwoud and Petulant, played by Giles Taylor and Christopher Logan. Logan specializes in the 18th century by the look of his biodata, but we singled out his performance as Bottom in Headlong’s A Midsummer Night’s Dream (set in Hollywood) as one of the outstanding performances of 2011. Both have the wigs, posture and beauty spots to carry their double act off. Logan is hilarious in every tiniest movement and expression. 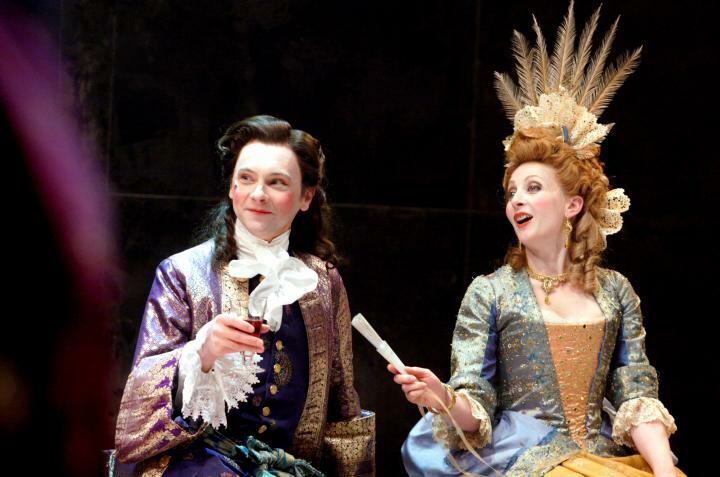 I’m also sure that the photos from the Chichester website don’t show the full glory of the fops’ wigs. Maybe they were improved. The women are all highly distinctive. Millimant (Claire Price) is the heiress pursued by Miribell (We also have Lady Wishfort, Waitwell and the Witwoud brothers, and yes, I think Congreve could have chosen more obviously different names too). She is fizzing with energy, and delightfully funny. Mrs Marwood is the scheming, plotting one (Hermione Gulliford), and Mrs Fainall (Rebecca Johnson) is the daughter of the rich dowager, Lady Wishfort. Incidentally, we are looking at a time when Miss and Mrs were interchangeable, both derived from Mistress, so that Mrs, like Mr, doesn’t bear the weight of marriage. Mistress would be less confusing than “Mrs” for Mrs Millimant who is unmarried. Calling them all ‘Mistress’ could have been a programme listing change. Lady Wishfort is the traditional Chichester big name, Penelope Keith. I’m still smiling when I remember how she curtsied and appeared to crick her back. We were mildly under-impressed by her Lady Bracknell a few years ago (too predictable) but in this she was perfect, bemoaning the ravages to her face (I look like an old peeled wall), but ever hopeful of luring a younger suitor. There are pieces of stagecraft to pick out. In the Chocolate House (Act 1 of the original five act play), the stage revolves to shift focus on the pairs locked in intrique. In the garden scene (Act 2 of the original), the couple can walk against the revolving stage as if on a treadmill, thus staying in the same place. Sir Wilful Witwoud (Jeremy Swift) is the country squire come up from Shropshire to woo Millamant, and his drunk is that rarity … a funny but believable drunk, who doesn’t go over the top. His business trying to get his sword into its scabbard is memorable, and he tries just long enough. Logan’s tipsy Petulant is another finely-judged drunken role. The pace was rapid and the wit sparkling. The play has some great lines in, and some very funny ones which haven’t dated. The interplay between Mirabell and Millimant where they discuss their conditions for marriage is masterly in execution on stage, but also in its writing. It resonates still in 2012. The character names with their obvious puns creak a bit nowadays … Wait-well the servant, Lady Wish-for-it, the frustrated dowager; Petulant, Witwoud (wit would); Fain-all, Foible. No, having typed them, they creak a lot, but you can get past that easily. Above all, the cast gave a powerful impression that they were really enjoying performing this smart and stylish play, never more so than the dancing at the end, followed by the most elegantly staged curtain calls I’ve seen in years. I can’t guarantee their enjoyment on a cold, wet Thursday afternoon was genuine, but they made the whole audience believe it was. The text has been cut in places, but also sharpened and tweaked line by line. No, I don’t carry the script of a play I last read thirty years ago in my head, but I went to the text when I got home. I was interested in checking a couple of references to foreigners … a Muscovite husband, drinking like a Dane, a Dutch puritan in a brewery, and Foible’s line about Lady Wishfort waiting to see her suitor: I warrant I worked her up, that he may have her for asking for, as they say of a Welsh maidenhead. My interest was Congreve’s joking references to a Dutch puritan, when the King in 1700 was the dour Dutchman William of Orange. It indicates a greater freedom of direct expression than a century earlier. But once you start looking … Congreve’s similar asides about Jews, Turks, and Musselmen (Moslems) have all been eradicated, as you’d expect. I’d love to see the play again, it was that good (Alas, this was two days before the end of its run, so no chance) but I’m sure there were many small cuts, tiny tweaks all over the place, at the level where prepositions have changed from in to on over the last four hundred years, or a the added or subtracted and so on. On the page, the speeches look long. I would guess an excellent text cutting and tweaking exercise has been done to enhance both clarity and pace. As usual with a five act play, Chichester did acts one to three in the first half. Each act has one location. I have two ancient paperbacks with the text. The Pan one (1965) divides Act III into three scenes. The Penguin one (using a print layout from 1950 in the 1970s) more usefully for production, cuts Act III into sixteen tiny “scenes”. Seen in the Penguin text, it immediately looks to have better pace and interplay than in the solid schoolbook text of the Pan edition.